Stone Cottage Adventures: BLOG HOP and GIVEAWAY! If you hop on board, your blog will be seen on 5 different blogs! 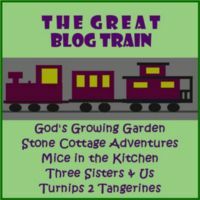 The Great Blog Train's third Great Giveaway! 1 Ad Space on "Three Sisters & Us"
300x300 Ad Space on "Mice in the Kitchen"
& this beautiful Apron (from "Turnips 2 Tangerines")!! There are many ways to enter & then don't forget to link up to the train below! Garden Chef's Needle and Pen Congratulations! The author of this wonderful blog is a nurse educator by day and a Blogger by night - her passion is cooking for her family, she is addicted to crocheting, loves to write & enjoys plants and dogs. Please checkout her lovely blog! Brianna is the author of this lovely blog - she loves to craft, scrapbook & cook. She is in a long distance relationship with the love of her life who happens to be in the Air Force. Many of her inspirational writing has to do with her "journey through life & love". Please checkout her wonderful blog! 3. 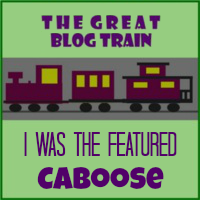 And last, but not least, connect to the boxcar in front of you (the blog in the linky just before you). Stop by that person's blog, have a look around and leave a comment letting them know that you stopped in! ready to board the rest of the train! Thanks for hosting Marci, have a great week! Tuesday's Brag About It Link Party Feature! Featured at We Made That! I Received the Most "Likes"